A magnificent piece of classic English furniture from the Arts & crafts / Art Nouveau period; circa 1900. This magnificent art nouveau wardrobe has a large out swept cornice, dental mould decoration. This sits upon a large centre section featuring a bevel edged mirror to centre. This is flanked by drawers and large opening door, utilising this space for hanging and storage of smaller pieces of clothing. All of this sits upon two large drawers with a decorative base section. The art nouveau wardrobe has been fitted with new clothes rails, and breaks down into five individual pieces for ease of transportation and reassembly. It also retains all of its original copper plated handles, and is in excellent condition for its age considering that it is over 110 years old. There is no significant damage; an ideal piece for any period bedroom setting or large country residence. Sadly, we do not possess any keys for this wardrobe. 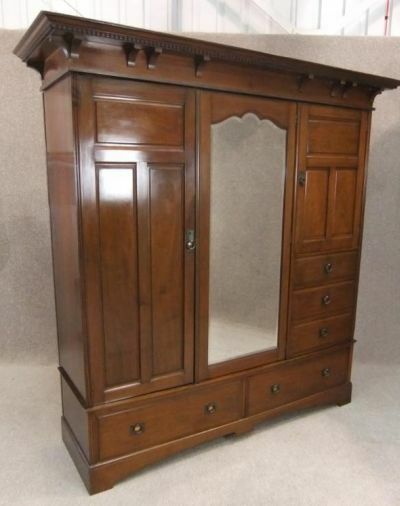 Please be aware that this art nouveau wardrobe is an old piece of furniture, and will have small marks and blemishes, and general wear and tear.